When the Mayflower set sail in 1620, it carried on board the men and women who would shape America: Miles Standish; John Alden; Constance Hopkins. But some among the Pilgrims were not pure of heart; they were not escaping religious persecution. Indeed, they were not even human. They were vampires.The vampires assimilated quickly into the New World. Rising to levels of enormous power, wealth, and influence, they were the celebrated blue bloods of American society. 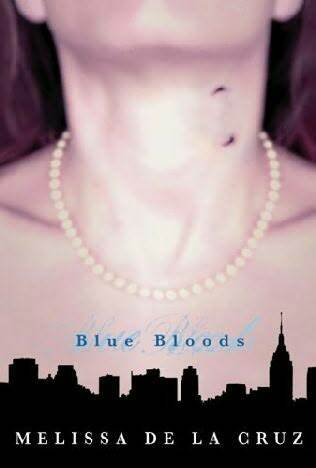 The Blue Bloods vowed that their immortal status would remain a closely guarded secret. And they kept that secret for centuries. But now, in New York City, the secret is seeping out. Schuyler Van Alen is a sophomore at a prestigious private school. Suddenly, when she turns fifteen, there is a visible mosaic of blue veins on her arm. She starts to crave raw food and she is having flashbacks to ancient times. Then a girl from her school is found dead... drained of all her blood. Schuyler doesn't know what to think. The first time I read this book, the story didn't really "grab" me at first. However, the more I read, the more I liked it. I like Schuyler and Oliver. I also really enjoy Schuyler's huge crush on Jack Force (the most popular boy in school). Yes, this is another YA vampire series, but it is well-done. Blue Bloods is definitely worth your time. The story was kind of slow to take off. I like the premise that some of our founding families were vampires.